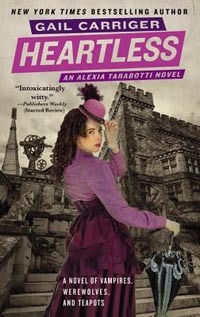 Among the books I brought with me outer Space, there is Heartless: The Parasol Protectorate: Book 4 by British author Gail Carriger. Alexia is witty, she has a strong character. Author Gail Carriger knows how to entertain with this paranormal Steampunk Britain series of sci-fi or vampire books. No wonder why it’s subtitled: ‘A novel of vampires, werewolves and teapots’. The first book of the series, Soulless, won the ALA’s Alex Award and a manga version was even released in March 2012. – The Finishing School Series: first book Etiquette & Espionage due out Feb. 2013 with three others to follow. And of course, visit her website for more information!